THE "You won't want to miss..."
of delicious recipes, shopping tips and wine! 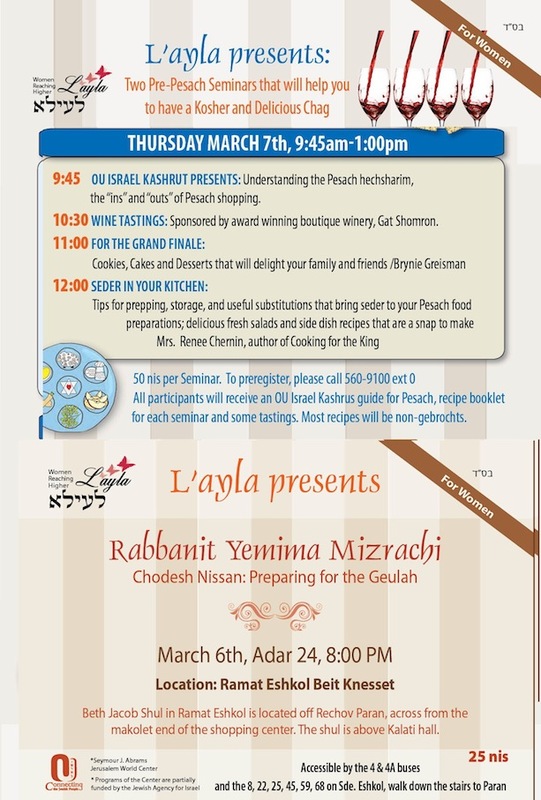 Jerusalem area ladies have an opportunity to start our Pesach preparations with a wealth of practical classes brought to you by L'ayla, the OU Center's newest initiative that is attracting women by the hundreds to a variety of classes and presentations. This month, director Rivka Segal has outdone herself! I'll be joining great presenters, the well known author Tamar Ansh and Bina magazine recipe columnist Brynie Greisman to give cooking demos with lots of recipes and practical tips to get you kitchen juices flowing. We'll get reviews and new information on Pesach hechsarim. Plus~we'll be treated to a wine tasting! Now that will make the weeks ahead seem much easier, right? Wednesday, March 6, the wise and beautiful Rabbinit Yemima Mizrachi teaches us how to approach the coming Geula of Pesach and arrive at our seder wearing the crown of our job well done. Wishing you a kosher and delicious chag!